(1Aug09)This issue will rerun the sail area math essay. The 15 August issue will talk about designing for the beach. "Check the messabout website: http://pwp.att.net/p/pwp-mwmess for the latest event news, photos of last year's happening, maps, and accomodation information. September is a busy month in the Lake Monroe area, so if your a hotel person rather than a camping type, you might want to book your hotel now." Miles Bore's Down Under Blobster is done except for the sailrig. In the meantime he cruises under gas power. 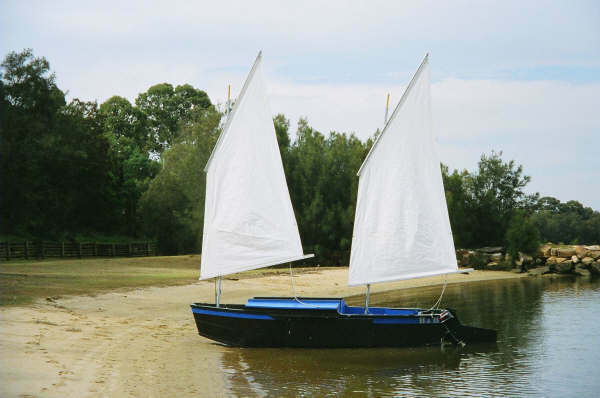 The Family Skiff is large enough to swallow up three men or maybe a family with two kids. She has two benches that are 7' long and there should be plenty of room for all. I would say her fully loaded maximum weight might be 900 pounds and her empty weight about 350 pounds, leaving about 550 pounds for captain and crew and gear. 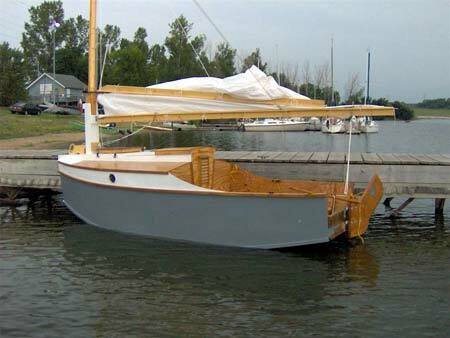 At the same time the Family Skiff can easily be handled solo, although with just the weight of the skipper she will not be a stable as when heavily loaded. 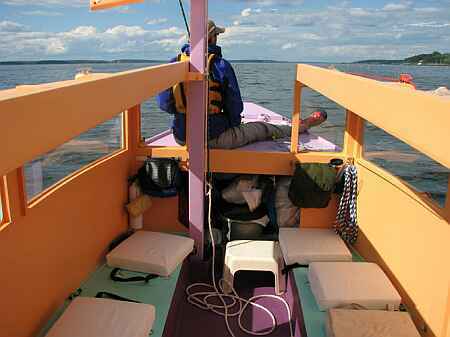 The boat also has two large chambers for buoyancy/storage and I can see her used as a solo beach cruiser because the benches and the floor space are large enough for a sleep spot. 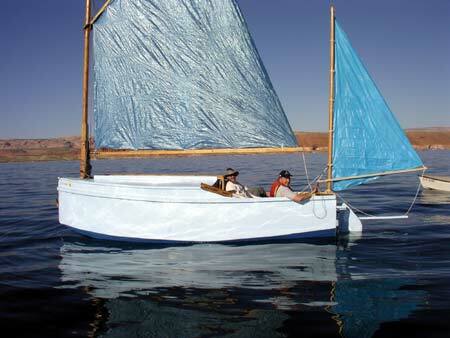 This shape of hull has proven to be both fast and able in rough water, a lot better than a similar flattie. I've made her deep, too, with lots of freeboard. 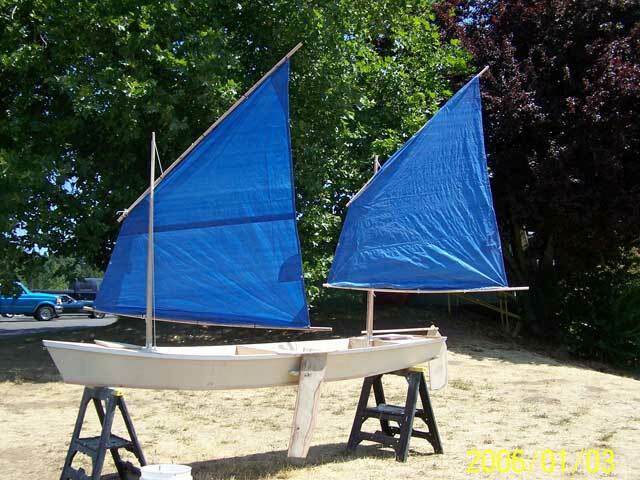 The balanced lug rig sets on short spars and sails very well reefed, in fact can be set up with jiffy reefing. 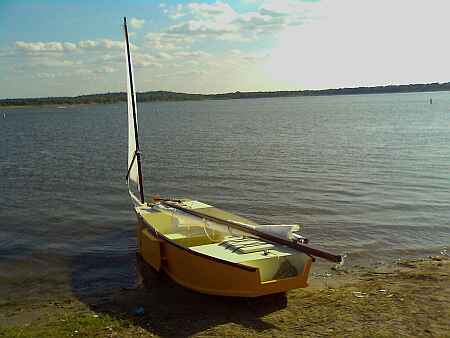 The spars are all short and easily made and stowed, the mast being but 14.5' long and setting 97 square feet of sail. In addition there are oar ports for those with lots of time and little money and a motor well for those with lots of money and little time. 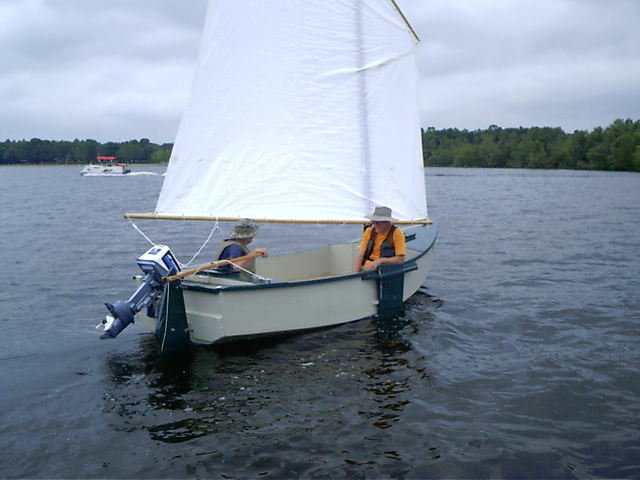 Two horsepower is all that a boat like this can absorb without going crazy. 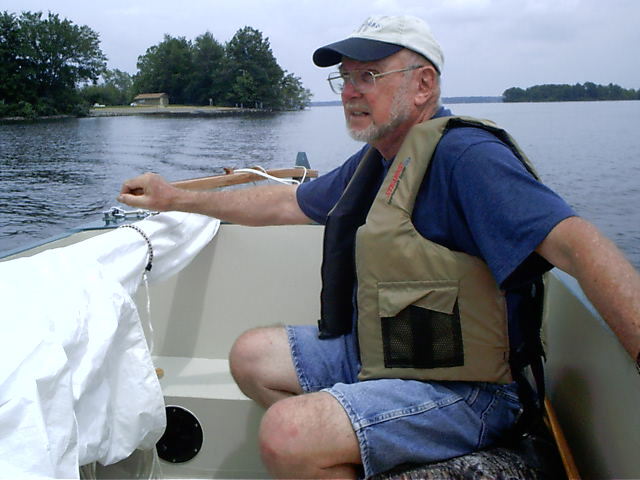 The motor well is actually an open self draining well that uses the full width and depth of the stern. It will come in handy for storing the wet and muddy things you don't want inside the boat, like anchors and boots. I've suggested in the plans that the rudder can be offset to one side a bit to give more room for the motor. 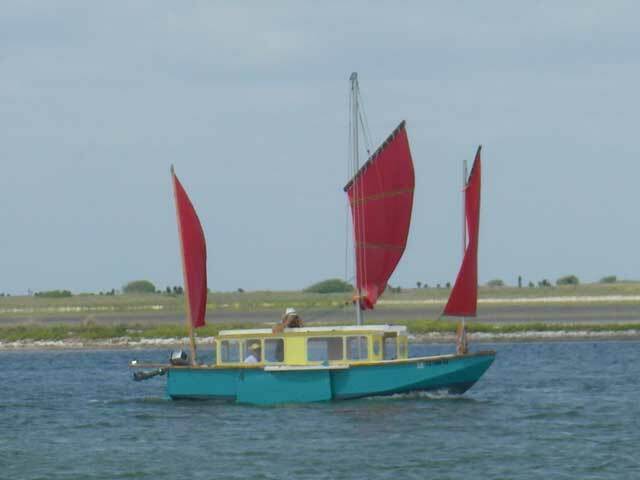 both Petesboat and Frolic2 have used an offset rudder with no harm other than perhaps needing a curved tiller to make it more comfortable. 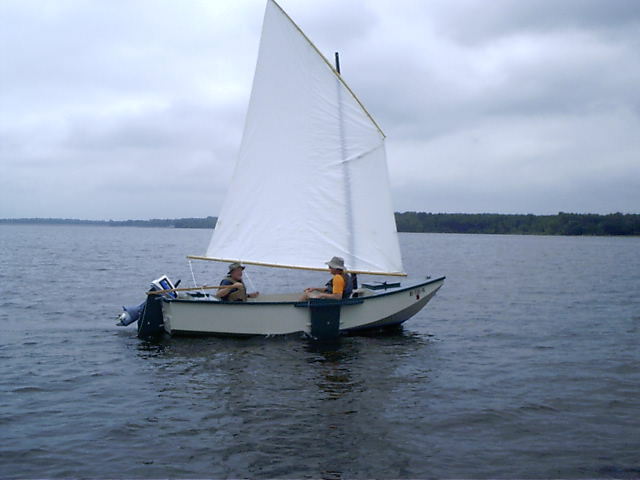 In the case of Petesboat the 60hp motor was on centerline and the rudder way over yonder to one side with linkage to a centerline tiller. Pete said the large rudder offset had no effect on steering. An ideal family boat in a way. The offset motor/rudder all seemed to work well. We were all happy with the outcome. 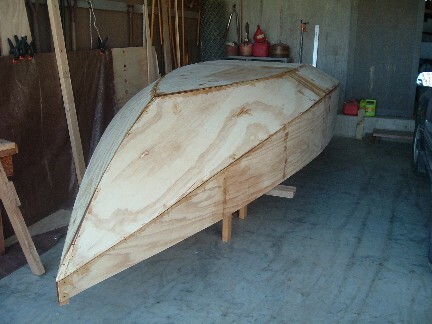 Family Skiff is a tape seam hull requiring two sheets of 1/2" plywood, five sheets of 3/8" plywood and two sheets of 1/4" plywood. 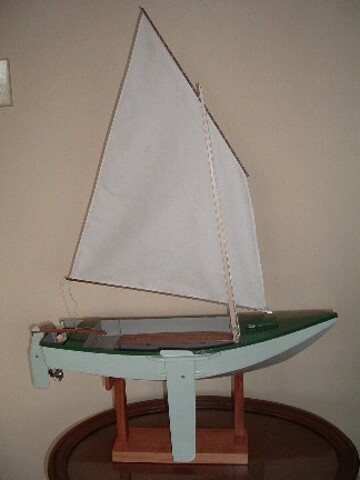 Plans for Family Skiff are $40. And a new Down Under Blobster is off cruising under outboard power as it waits for its sailrig. 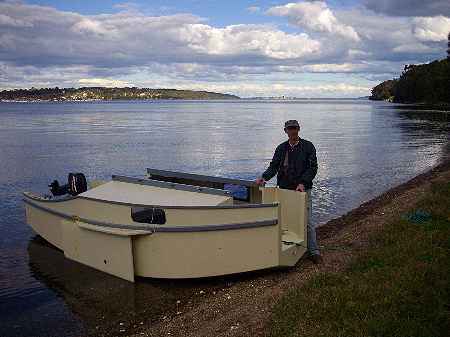 And another builder tried a half sized Laguna as a proof of concept thing and claims he ain't gonna sail it!